With a few simple steps and a glass cutting tool, you can get a custom-cut mirror in no time. Mirrors enhance any interior as both decorative and highly functional features, bouncing light and offering an opportunity to check your appearance before running out the door. Finding the right one for your needs—now that’s the ticket. 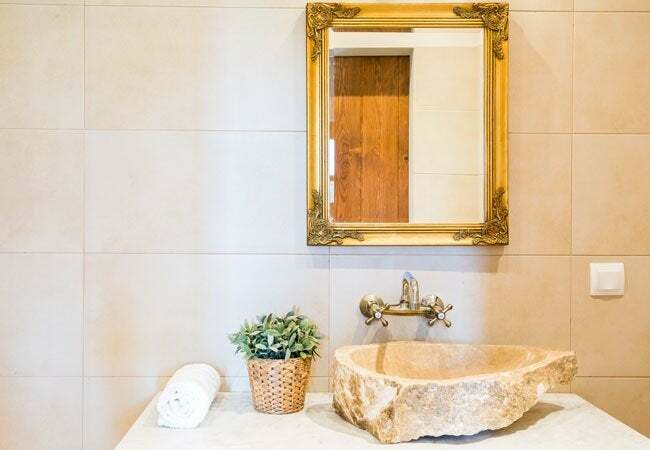 Fortunately, when a homeowner wants to repurpose a picture frame to contain a reflection or can’t find quite the right size of mirror to hang in the bathroom, he or she isn’t doomed to shell out hundreds of dollars at a glazier or framing shop to get a custom cut. With the right tools and a little know-how, anyone can learn how to cut a mirror to the exact dimensions desired using a technique similar to cutting glass (after all, a mirror is essentially aluminum-painted glass). If you’ve never cut either material before, consider visiting a local glass-cutting or framing store and asking for some scrap glass to practice the following steps on. Before setting out on your project, keep in mind that some jobs are best left to the professionals. Don’t attempt to cut a piece of glass longer than 24 inches, because scoring and breaking the expansive surface will be difficult and dangerous. Likewise, you shouldn’t try cutting anything less than one-half inch in size, since the restricted workspace creates a greater risk for cutting yourself. These steps for how to cut a mirror are best saved for smaller DIYs, like filling a frame or adding additional facets to an ordinary rectangular sheet. 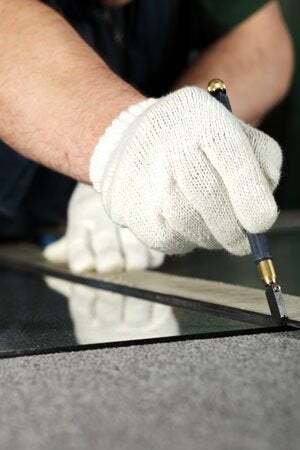 Lay several sheets of newspaper atop your work surface, which should be a flat and sturdy tabletop large enough to accommodate the uncut mirror pane. The layer of newspaper creates a smooth surface so the bumps and flaws in the table don’t impact the cutting process. Clean the mirror with a glass cleaner and microfiber cloth. 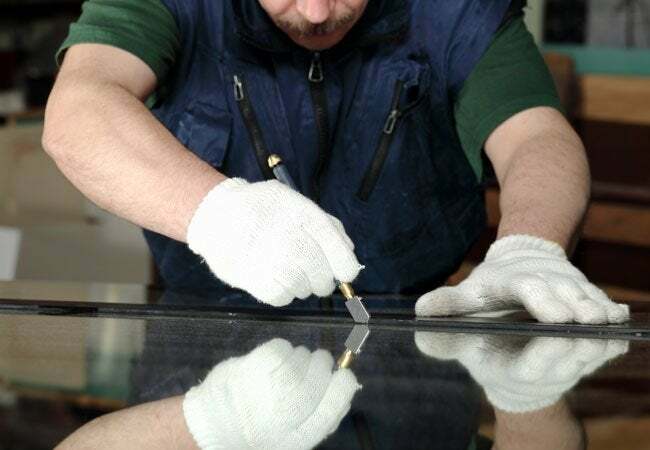 This step is crucial; any dust, dirt, and residue on the mirror’s surface can impede the glass cutter’s effectiveness and produce a jagged edge. Lay the mirror on your work surface and measure it with a ruler, framing square, or measuring tape. Note that if you’re cutting the mirror to fit into a frame, you should make it a few millimeters narrower than the framing space; that way, it’ll fit perfectly into the opening. Mark along the cut line with a wax pencil or a marking pencil. Don good-gripping work gloves and protective eyewear. Then position a straightedge along the measured marks you made in Step 3. If your straightedge doesn’t feel secure against the glass, you may want to attach it to the mirror with loops of masking tape placed underneath. Whip out your glass cutter, and wipe the wheel with paper towel dampened with a few drops of cutting oil in order to remove dust and lint. You’ll also want to place a drop of oil on the tip of the wheel; this helps you achieve a “dry” cut and increases the odds of a clean break, rather than one that veers off-path and has slivers. Position the glass cutter on the surface of the mirror, against the far end of the straightedge, and pull it toward you. Press the cutter into the glass with moderate force, being mindful that too-hard pressure may break the mirror and too-soft pressure won’t successfully score the surface. Working with the right pressure will sound like you’re “ripping” the mirror. Complete the cut in a single movement from one end of the mirror to the other, which will prevent jagged edges. Avoid making multiple scores along the straightedge. After scoring the glass, you’ll need to break it along the scored line. Set the straightedge aside, and carefully slide a dowel underneath the mirror along the full length of the score. Lay one palm on either side of the dowel and firmly, but carefully, press down on the mirror. It should snap along the cut line. To eliminate any slivers or jutting pieces of glass, place a two-inch square of fabric or cardboard in the jaws of square-headed pliers, then gently break off the pieces of mirror. The fabric or cardboard should protect the cut edge from fragmenting. Rub the edges of the cut mirror with fine-grit sanding foam, sanding block, or sandpaper. A smooth edge will make the mirror safer to handle. Once sanded, set the mirror aside and start cleaning up the workspace. Always gather the newspaper from the outer edges, so any slivers of glass will be bundled up inside. Vacuum the space to collect any stray shards of glass, and wipe the work surface down with a wet cloth. Then it’s time to clean the cut mirror and hang it up, where it will serve as a dazzling custom decor piece in your home!